I think this may be my favourite episode in a long time, to hear three disparate creators so completely passionate about their projects, and what the represenation they are providing means to them is positively invigorating. Seanan’s initial happiness at getting the Excalibur team (Here’s hoping she’s getting to handle Doug, who I think has yet to show up) to the excoriating description of how important Meggan was to her personally was a highpoint, if I may say so. That was indeed a very important moment. A couple of points: Romani in English-speaking countries suffer from a poisonous racist combination of patronizing romanticization (superficially positive, but in reality profoundly othering) and overtly hostile demonization. The conception of Meggan as a character in the ‘80s was obviously shot through with the former. And it relates to the Brian Braddock relationship — leaving aside the possibility of him displaying violent overt prejudice, there’s the question of how easy it would be for someone of his background, who probably grew up on things like Enid Blyton novels (I’m speaking of Brian in the ‘80s and early 90s, who would have been a child in the ‘60s and ‘70s – no idea if it would be as true of contemporary Brian), not to have large elements of the former in his attitude to Meggan’s Romani ethnicity. The other point is that I think it’s important to note that blonde, blue-eyed Meggan is not somehow “un-Romani” in appearance. I’m not criticizing Seanan McGuire when I say that— I suspect that she’s more aware that the perception that all Romani look the same is racist than I am. But I can see that someone might draw the inference from what she said, and it’s a really important point. There have been horrifically awful incidents in which Romani children have been forcibly removed from their parents because they were blond and so “couldn’t really” be Romani, or in which Romani families have faced threats and violence for the same reason. Dublin (where I’m from) has a particularly shameful record in this area. I normally don’t like the live episodes as much, or the episodes that deal with current comics that I’m years away from reading… But I have to agree with this comment. Seanan’s account of growing up Romani was profoundly personal and insightful and was seriously something I’ve never given any real thought to before. Thank you so much for sharing of yourself and enlightening us all. Holy crap, I made it. I think it took about five months of listening to no other podcasts at work or in the car (other than proofing my own), but I’ve binged my way through to listening as they come out! I love the show! And if you need a guest X-Pert when you hit Phalanx Covenant, Generation X or AoA, I offer myself as tribute. Me too! 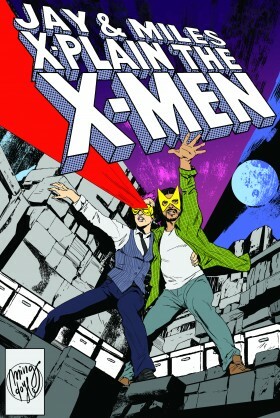 Well, in the, “I’m finally caught up on Jay and Miles,” thing, not the expertise on X-Men stuff thing. I’ve been reading for around twenty-five years, and X-Men are all I really gave a crap about until I got older and Y: The Last Man, Walking Dead and Invincible started hitting shelves. And of course, Saga. Congrats on our joint milestone! Even when we’re firmly entrenched in the 90s, my favorite era, it’s fun to listen to people talking about stuff I still remember reading for the first time. Not to mention binging the show has inspired me to finish collecting a full X-run, in floppies, of everything from DoFP thru AoA…and I’m probably at least 65% there! I caught up to the podcast fairly recently, and it’s a little depressing – instead of listening to 10+ episodes a week, I now only get to listen to one. Sad face. Also, at a certain point, the episodes I was listening to caught up to where I was at reading-wise, and I was able to read a batch and then immediately listen to podcasts about what I had read. That was awesome. Now I’ve gotten past Onslaught (fyi, I loved Onslaught, not sure why people complain about it – is it complicated and weird and maybe a little cheesy? sure, but isn’t most of X-Men? ), and the episodes are available at what feels like a snails pace (compared to having years of back-catalog available before). Sad face again. Absolutely loved this episode, but I find myself wishing there was a transcript, because I had a hard time reliably telling which guest was which.